P. esseriana and resting P. cyclosecta hanging out together on a chunk of black scoria. Aren't they cute!? Hey guys, Alvin speaking. 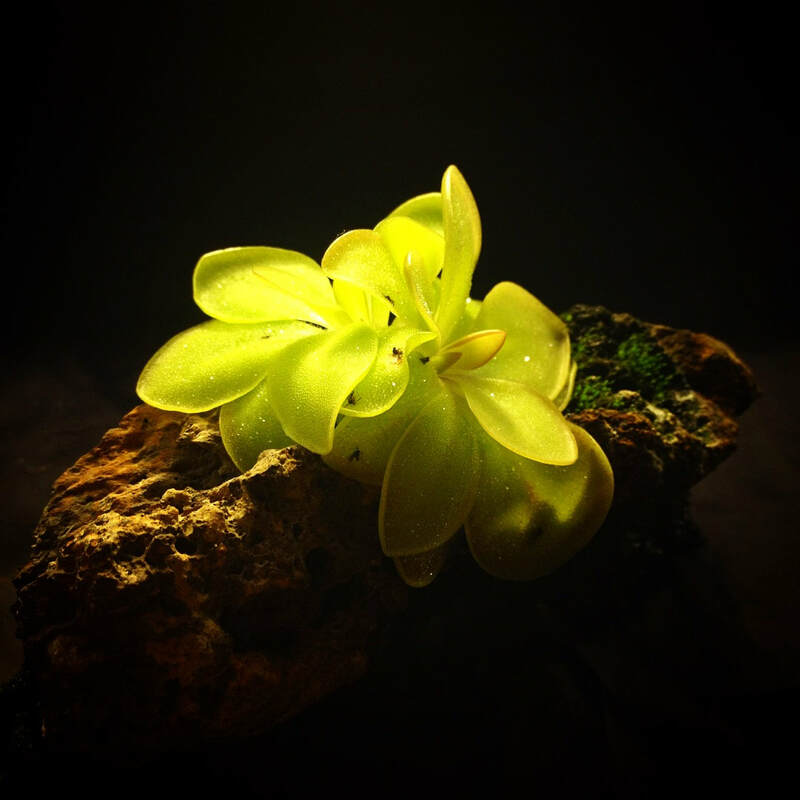 We don't seem to have too much representation from Pinguicula on our blog at the moment, so it's time to rectify that. Enjoy, and please let us know if you find this post helpful! 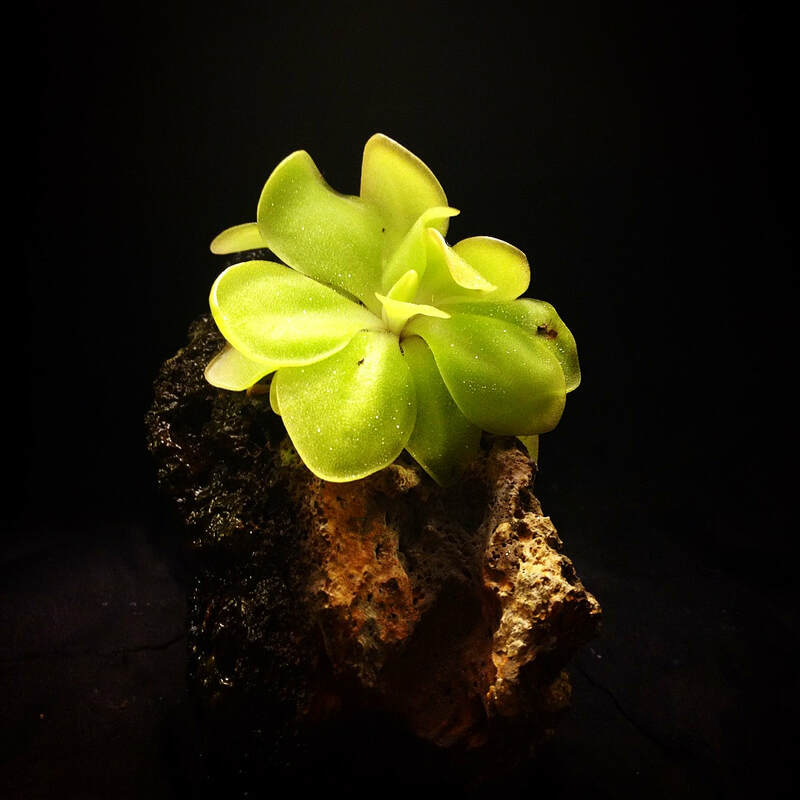 Mexican Pinguicula rock plantings seem to have really exploded in popularity recently. It's not too hard to see why - the sight of a healthy specimen perched on a well-shaped rock evokes mental images of colonies of plants in situ hanging off of sheer limestone cliffs. As the young ones might say today, it's aesthetic. It certainly doesn't hurt that Pinguicula rock plantings are hardly more difficult to maintain than plants grown traditionally in pots. Perhaps this new fad is exactly what the genus needs to gain some more well-deserved attention; we already have plenty of dewheads and pitcher planters (myself included)... it's time to get more people growing butterworts! P. moranensis/rectifolia? (Sold to me as P. potosiensis but the legitimacy of that name is hotly disputed.) 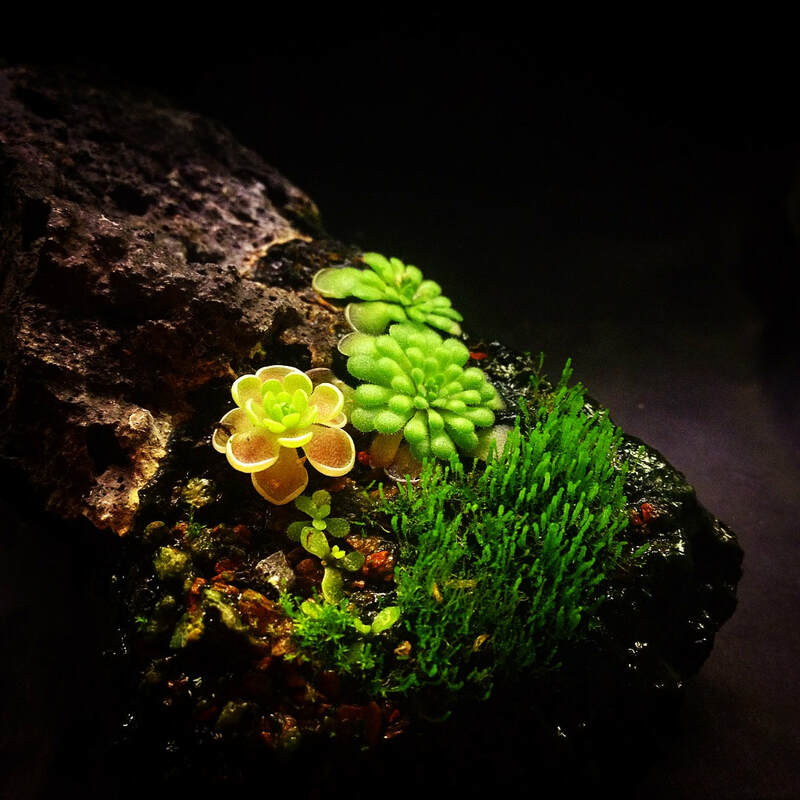 I put one plant on the rock initially and it later divided. 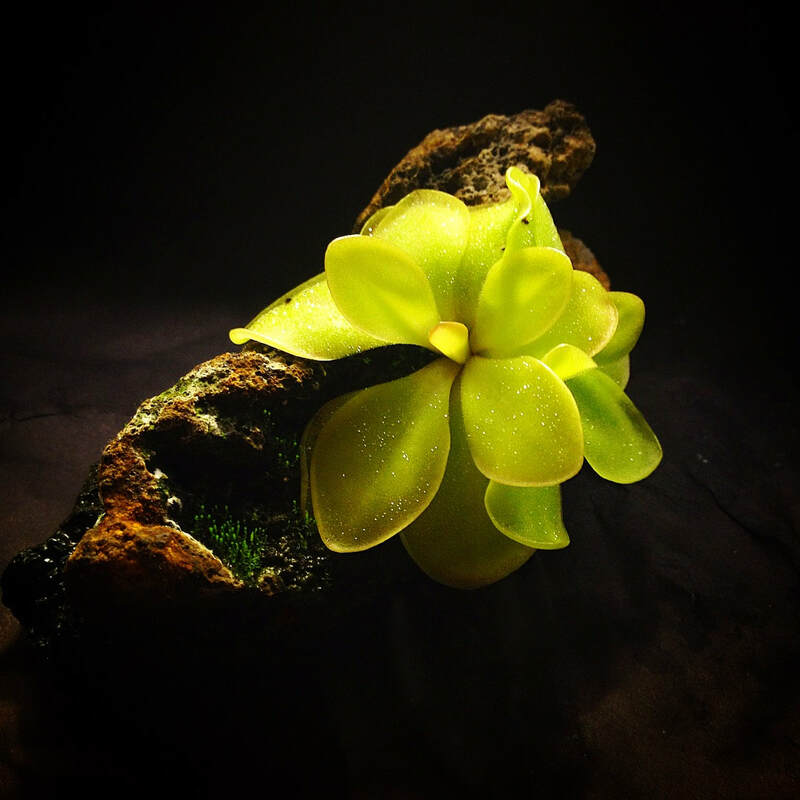 To begin your rock planting, you'll want to select a suitable rock. This is very important (unless you're a person who has the time to constantly babysit each of your individual plants), since you do not want the plants to desiccate, especially during the growing season. Ideally, you would use a chunk of pumice as your base - it wicks water extremely well and is prone to having convenient little pockets that plants fit snugly into. I used basaltic scoria for all of my plantings. It doesn't have quite the same water retention capabilities of pumice, but it's still quite adequate and I appreciate the more rugged look that it offers (pumice is a bit too "lightweight" for my tastes, although I have seen some really superb plantings done on pumice). 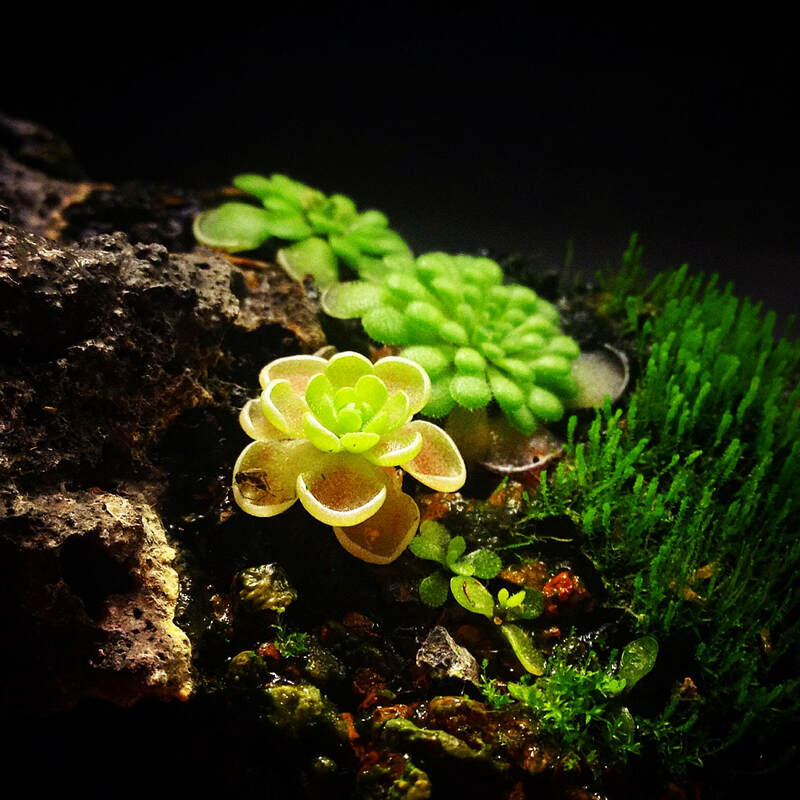 Regardless of whichever rock you use, you'll want to be sure that there are indents or pockets in visually appealing places where you can stick the plants. If there aren't, you may want to consider taking the initiative and drilling some holes in yourself. Take into account how you want the final product to look - do you want a single large specimen, or a variety of species clustered together? 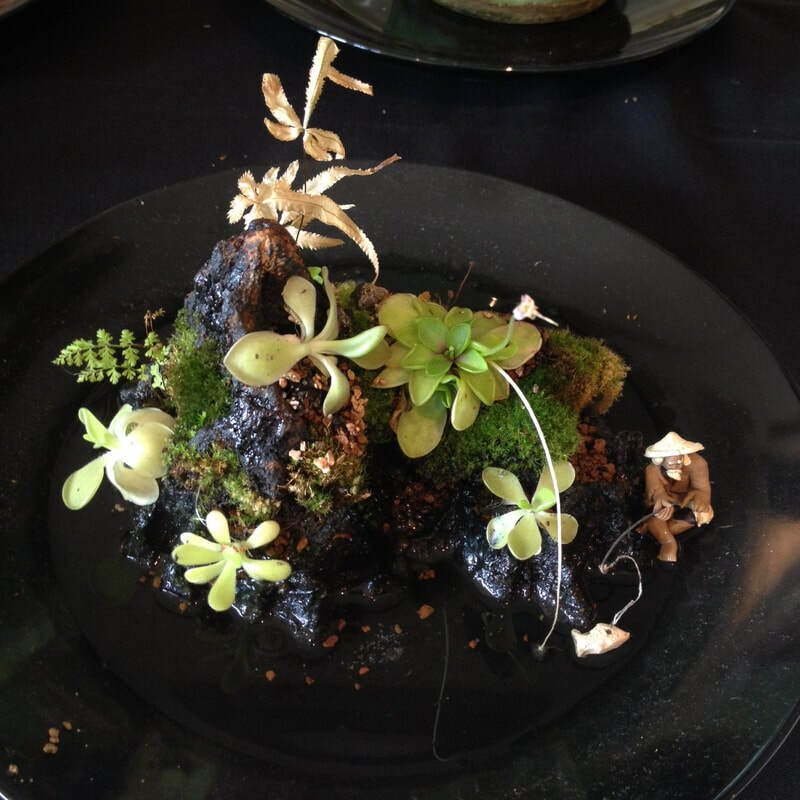 Do you want to have the plants hanging off of a vertical surface, or spread out on top of a larger, flatter rock? It would also be wise to take into account the growth habits of the species you plan on using, as well as how their colors and profile might balance out. It's all really up to your artistic tastes. An excellent planting prepared for the 2017 NECPS Fall Show by Emmi K. Getting creative with your containers and accessories is also an excellent way to enhance a planting. Once your rock is prepared, you can begin adding plants. Wash whatever media they were in before off the roots and carefully insert them into the spot you've selected. It may be necessary to stuff the indent with Sphagnum or peat moss to help anchor the plants initially, since it will take the roots some time to work themselves over the rock. Place the rock in a tray of water so that the moisture is able to wick up to the root zone (I hope that you took this into account when selecting your initial rock; if you didn't and decided to go with an unreasonably tall or non-porous one, you'll have to water the plants very frequently). The water level should be below the plants' leaves but high enough so that the roots receive sufficient moisture. Treat the plants how you would normally grow your Mexican Pinguicula - meaning lots of light and mild temperatures, naturally. Humidity is not a major concern. The only maintenance required for the rest of the growing season is keeping the water level topped up. It's that simple! 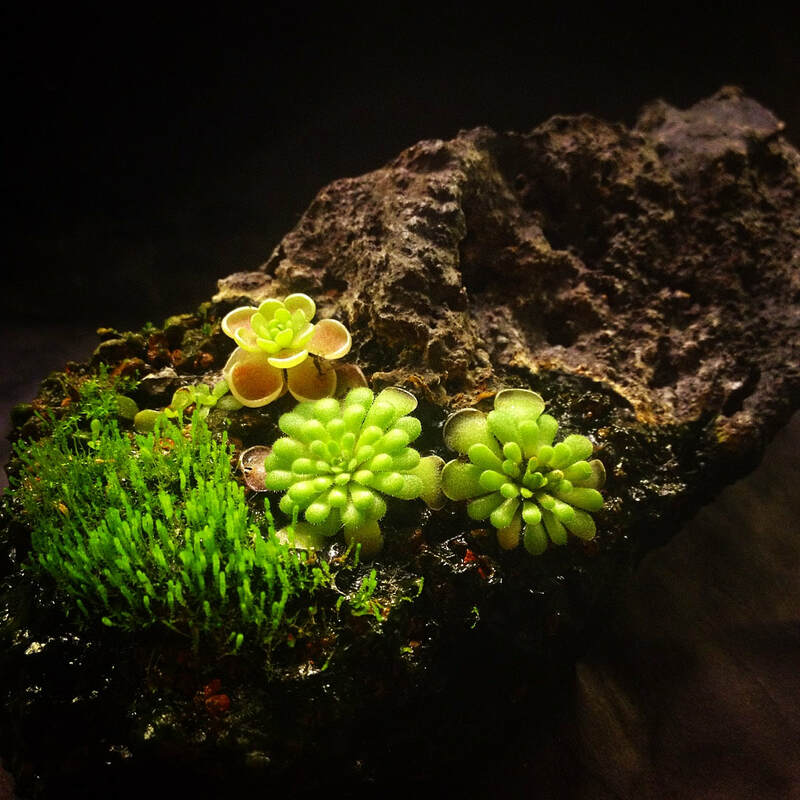 The P. cyclosecta have put out their succulent leaves while the P. esseriana is still actively growing (and even tossing out plantlets on the bottom right). Things might seem to get a little tricky once your plants begin to enter their annual winter resting phase. Do not fret! As soon as you notice thick succulent leaves replacing the gooey carnivorous ones, simply lower the water level so that the plants stay a little bit drier. Since different species can start doing this at different times it may get a tad complicated, but most Mexican Pinguicula species are pretty tolerant regarding moisture levels (as long as they're not sopping wet) so you should be able to get past this period without major issues. In general, it's better to err on the side of caution regarding water - I've observed that during dormancy Mexican Pinguicula tend to be pretty tolerant of drying out, while over-watering can cause them to rot. I have taken rock plantings through two winters so far without any losses. 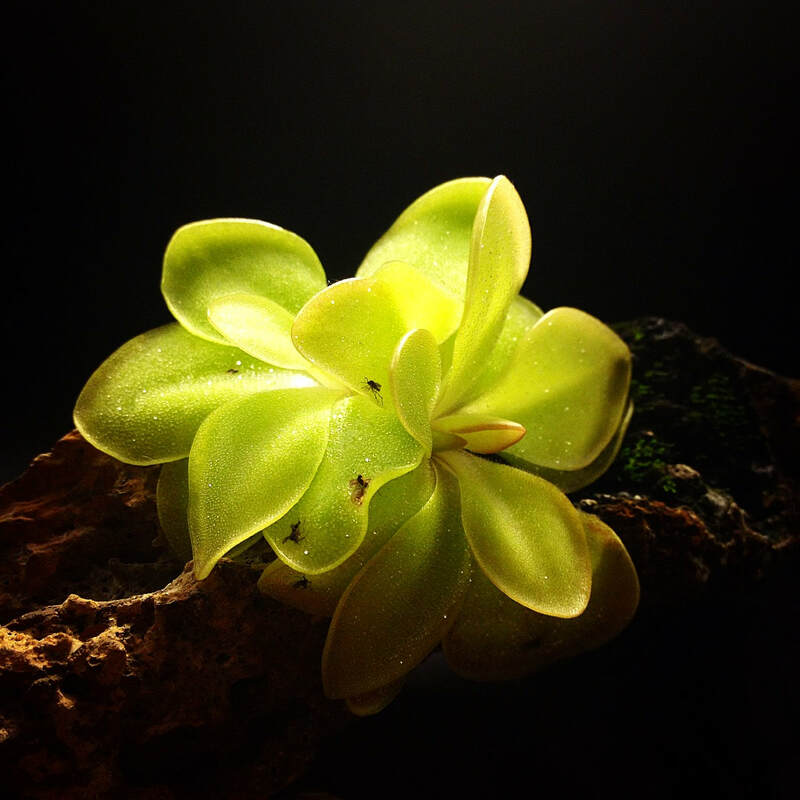 If you're a fan of Pinguicula and haven't tried this method of growing them yet, I highly recommend that you do so. It's incredibly rewarding and not significantly more difficult than growing them traditionally. The only drawback I can imagine is that rock plantings may require more room - but as CP growers I'm confident that we've all had excellent practice in cooking up flimsy excuses to procure more growing space. Moss colonized the rock relatively quickly. Luckily it doesn't interfere with the plants and looks quite nice. What's not to love about sticky things on rocks?